Jim Cramer will be the first to admit it: he hates next week. It is the busiest reporting week of the year, which means he anticipates volatility in the market. "There will be more snap judgments — and more wrong judgments — than you can imagine," the "Mad Money" host said. Halliburton: The stock is looking attractive with the recent run in oil. However, Cramer still likes best-of-breed, and that means he prefers Schlumberger. Apple: Cramer still stands by his motto of owning Apple, not trading it. But just like everyone else, he believes that the quarter won't be a knockout. However, he does think Apple could continue its positive ramp-up in service revenues. In fact, the stock's valuation is one that he would associate with a deep cyclical, not a growth stock. "The market is lapping up deep cyclicals, so I don't think the damage will be nearly as bad as I keep hearing about," Cramer said. Cramer sees an intense love affair with value stocks. Unfortunately, growth stocks have been kicked to the curb as part of a vicious stock rotation, and it could be just beginning. "What is incredible is that it doesn't even seem to matter how bad the deep cyclicals are or how good the growth stocks are. They are going to go in divergent directions when they report," the "Mad Money" host said. When Southwestern Energy reported, Cramer didn't see anything he liked from the company. Yet, it seems to have survived the downturn in the price of natural gas fairly well, better than Cramer would have thought a few months ago. Investors agreed, and the stock rose 15 percent Friday. The action in Southwestern instantly triggered everything around it, ranging from natural gas to oil master limited partnerships. "I think that at this pace, with oil up again … we are going to start seeing takeovers of both oil and gas companies before their stocks get away," Cramer said. Skechers rose 6 percent on Friday following its first-quarter earnings. However, Jim Cramer thinks there could be more room to run. "We are just scratching the surface, and no one knows how big it can be. We could be monstrously big," Skechers Chief Finance Officier David Weinberg told Cramer. While the stock is still down 40 percent from its 52-week high, it has surged more than 100 percent in the past two years. While most sectors trade in lockstep, there are still some areas where individual stock picking matters. Some succeed, and others fail on their own merit. One of those groups is the airlines, and with a hideous decline in United Continental on Thursday, Cramer still considers Southwest Airlines to be among the best in the group. Southwest reported a strong quarter on Wednesday, including $1.2 billion in free cash flow. While some of the strength stemmed from lower jet fuel prices, some comes from new capacity, which could be worrisome as, historically, capacity can set off a price war between airlines. Cramer spoke with Southwest's CEO Gary Kelly, a 29-year veteran of the company. Since its inception, Southwest has never laid off a single employee. "I give all the credit to our people. I think they are the best in the business. We have very low cost, we offer great service, it's just a powerhouse combination," Kelly said. 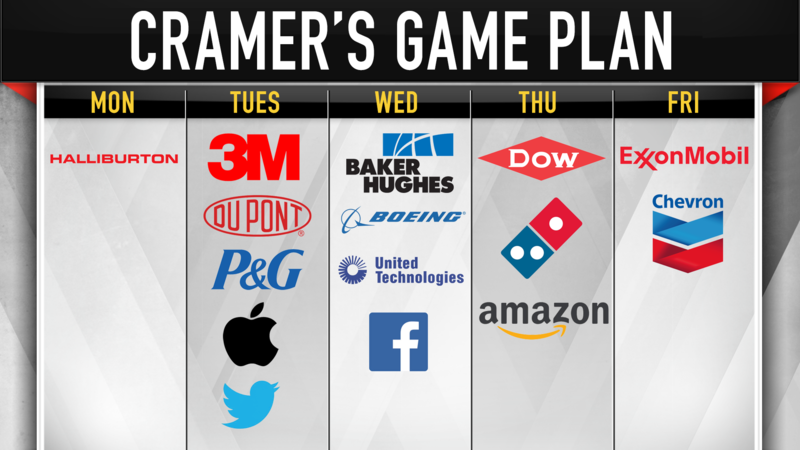 Cramer is always on the lookout for private companies with game-changing technology. Highfive is a business that has simplified the conference room by dominating the video conference space. Its technology provides easy screen sharing and all-in-one video and audio that can be controlled on devices, laptops, tablets and phones. Highfive has significantly expanded its customer-base growth since the company was founded some 18 months ago. Cramer spoke with Highfive's founder and CEO, who explained the reason behind the growing popularity of video conferencing. "We are seeing some really big secular trends happening that are causing people to be more comfortable with video. The new workforce is all at an age now that they grew up with video," Sinha said. B&G Foods: "No, I used to be higher on it but not anymore. Not when you've got stuff that I see flying, like a Kellogg, like a Smucker. No, we are not going to go there. B&G was OK, I got better places now." Cameco Corporation: "Periodically people tell me I've got to take another look at it. I have looked at it and looked at it, but my conclusion is don't buy."